Southern West Virginia and Technical College launched a multi-year Vision 2020 Major Gifts Campaign on September 7, 2006, with the goal of raising 20 million dollars by 2020. 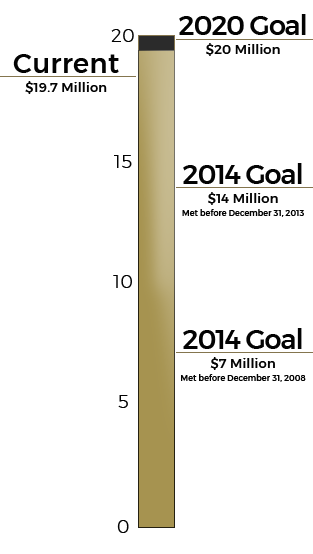 Through the generosity and support of its many donors, the campaign reached its 2010 goal of $7,000,000 by December 31, 2008. Phase Two of the campaign was launched in January 2010 with a second $7,000,000 goal by 2015. The 2015 goal was achieved by December 31, 2013. The Vision 2020 Major Gifts Campaign is now in Phase Three with its final goal of raising $6,000,000 by December 31, 2020. Investments from this innovative undertaking has permitted Southern to grow new and expand current credit and non-credit programs, support the construction of the new Center for Allied Health and Technology, and expand workforce development efforts in the areas of coal mining, natural gas exploration, computer technology and allied health, and marketing. With limited State dollars, the Foundation and College realized their vision had to involve not only these entities, but also the community if we were to provide a strong economic and academic future for southern West Virginia. Since the campaign began, the College has been able to quadruple the number of scholarships provided to its students. One of the most noteworthy strengths of the campaign has been the support of Southern West Virginia Community and Technical College employees who are committed to the College's mission and vision, and the future growth and development of the region. Approximately 91 percent of the employees have donated to the campaign, which has provided more than $1.5 million dollars. Since 2014, Southern has been fortunate in having Mr. George Kostas, local businessman and entrepreneur, to serve as its Chairman for the Vision 2020 Major Gifts Campaign. The success of the campaign and support by the local communities has been extraordinary. We were deeply saddened by the passing of Mr. Kostas on February 25, 2018. The campaign has surpassed its goals because of his vision and direction. Early in its formative years, Mr. Kostas and his wife, Elizabeth, formed an association with Southern West Virginia Community and Technical College. They were involved in providing a private family gift for the Savas-Kostas Performing Arts Center, and have provided perpetual funding for the Savas-Kostas Outstanding Faculty and Staff Award for Excellence. Additionally, Mr. and Mrs. Kostas have actively and continuously supported the Southern Foundation. Campaign oversight has been passed to the Southern West Virginia Community College Foundation Board of Directors and its president, Mr. Eddie Canterbury.